Sandra departed this world for heaven on January 22, 2019 after a short illness. She was born on October 18, 1951 to Joyce Rose (Fisher) Wilson and Robert (Sonny) Lee Wilson. She is survived by her daughter Abigail (Cronk) Gale, son-in-law Brandon Gale, sister Diana Wilson (Gary) Williams, brother Robin Wilson, nephews Craig Johnson, nieces Andrea (Williams) Campbell (Jim Campbell) and Kelly (Williams) Heath (Joe Heath), step-father Jimmie Cagle, great-nieces; Kathleen Johnson, Isabella Heath and Skylar Campbell, and several aunts, uncles, cousins, and friends. She was preceded in death by her mother, father, nephew Lee Johnson, and several aunts, uncles, cousins, and friends. Sandra was a shining light and never knew a stranger. Once you got to know her, she was a friend. She was loving, caring, warm, funny, and would do anything for those she loved. She loved her home, gardening, reading, family, and friends. Sandra leaves behind many friends. Claudia was her neighbor for many years and Judy was her friend, turned sister-in-law, turned friend. Sandra was a member of her “Wednesday Night Group” comprised of neighborhood friends Linda, Larry, Joyce, Diana, and Patsy. They would go to dinner weekly and laugh, talk, and catch up on each other’s lives. Sandra became close with her ex-coworker Brooke. They talked about life and made each other laugh. There are so many people that impacted Sandra’s life, too many to list. However, Sandy enjoyed her time with friends and family, all of whom held special places in her heart. Sandra had a list of careers, ending with being the Recording Corresponding Secretary for the International Union of Operating Engineers Local 112 from the time they opened in 2007 until her retirement on December 31, 2016. Sandra loved working for the union and helping members with everything from insurance, pensions, and everything between. Sandra left a lasting impression on those she worked with and she enjoyed talking to union members. When I think of my mom, I see her smile in the photo above. I hear her laugh, I think of sunlight and flowers. I think of love and peace. I think of my hero and how she never let me believe that I was anything less than enough. Our family appreciates every prayer, message, text, conversation that people have sent our way. Visitation will take place at Owens Funeral Home, 412 North Harrison Street, Alexandria on Tuesday, January 29, 2019 from 4:00 PM to 6:00 PM with a memorial service following. Owens Funeral Home is honored to care for Sandra and serve the Cronk/Wilson families. 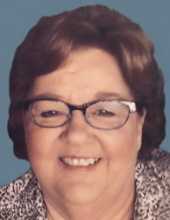 To send flowers or a remembrance gift to the family of Sandra Kay (Wilson) Cronk, please visit our Tribute Store. "Email Address" would like to share the life celebration of Sandra Kay (Wilson) Cronk. Click on the "link" to go to share a favorite memory or leave a condolence message for the family.